At least 10,000 baby salmon have been released into a Staffordshire river, more than 100 years since the fish was last found there. The salmon were released into the River Churnet at Consall Forge, near Leek. The Churnet was once a salmon river but stocks died away due to pollution. An Environment Agency spokesman said the river was once possibly the worst polluted in Europe. The water quality has now improved and it is hoped the salmon will thrive. The river became polluted as a result of industrial changes in the 19th Century. 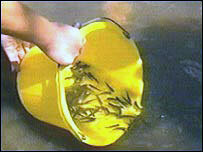 The young fish which have been released are from 3 to 10 cm (1 to 4 ins) in length. It is hoped they will spend the next winter or two in the Churnet before heading out to sea. Eventually, it is hoped they will return to the Churnet to spawn. Fisheries officer Mick Buxton said it was important people helped the salmon to thrive by taking care to make sure the river did not become polluted again. Dangers include oils and chemicals, agricultural matter which might enter through surface water drains or by household plumbing being wrongly connected to the surface water system. Mr Buxton said: "This is an historic time for the River Churnet as we return the salmon to one of its natural homes."